Are you a teenager trying to navigate faith through chronic illness? I’m here to tell you, you are not alone. When sickness takes over your life, it’s a never-ending battle to make it through each day. How do you cope? How do you keep fighting? Most of all though, how do you find God in the midst of the suffering? Through my own journey of sickness, I’ve struggled with the same questions—questions we all think but are afraid to ask. My name is Sara, and I’ve been sick with Lyme disease and more since I was fourteen. Those questions you’re afraid to ask? I’ve asked them too—as have many others. This book addresses topics and questions such as: Why is there sickness? Where is God in sickness? Resting in the storm How to deal with the way chronic illness changes you Joy and despair Hope Praying through chronic illness Relationships in the midst of chronic illness And more! The journey of illness is not an easy one, but hope remains. God hasn’t left us. He hasn’t forgotten us. 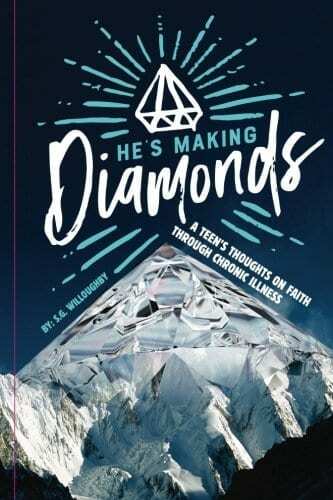 On the contrary, He’s making diamonds out of us.